Overflowing papum and Poma river creating havoc in Sangdupota circle and the recent flood fury have washed away many houses , roads, rafting centre and created untold suffering to the people. The heavy downpour for last more than a week have damaged the road leading to NIT and circle hq at Sangdupota and created untold suffering to the people living in more than twenty villages of the area. 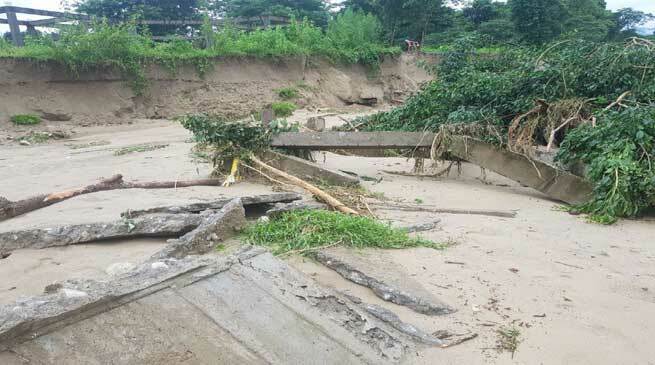 Immediate attention of state government is sough and appeal for deputing of team of Disaster management officers and administration for immediate asses of the flood damage caused by river ad heavy downpour Takam said. He said that the local bus service and means of transportation and communication is also disrupted owing to pathetic condition of Gohpur Tinali and Jote and Sangdupota road, large area of agriculture field, horticulture gardens and many dwelling housed have been damaged and appeal for restoration work by the government.